How to create the entire campaign from beginning to end. How to use web scrapers to spy on your crowdfunding competitors. Learn how the Kickstarter/Indiegogo ranking algorithms work. Learn how to become a staff pick and get featured on crowdfunding sites. How to drive a massive amount of traffic to your campaign using growth hacking tools. The fees and post-campaign tax considerations. You’ll need a PC, laptop or mobile phone to access the course. Do you have a great idea but need capital to make it happen? Have you struggled to get funding for your idea? Or wary about giving away too much equity? Then crowdfunding might just be the right path for you. In July 2016, we embarked on a 28-day crowdfunding campaign on Kickstarter to raise money for our online learning platform for entrepreneurs. In just 28 days, we raised over $75,000 from 1000+ backers in return for ZERO equity. 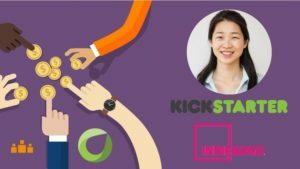 We want to share with you how we did it and distill 3 months of research into one evening so you can successfully crowdfund your idea. If you’re thinking of doing a crowdfunding campaign or looking to raise funding for your startup then don’t miss out. This is a one-time opportunity to get advice and learn all of our tips, tricks and tools. Entrepreneurs who want to fund their idea without giving away equity. Creators who are looking to pre-sell their product. Inventors who want to use crowdfunding to raise money for their ideas.